How to Measure Innovation (To Get Real Results) by Soren Kaplan | That Girl Shines Services Inc. I love drawing. I love innovation. 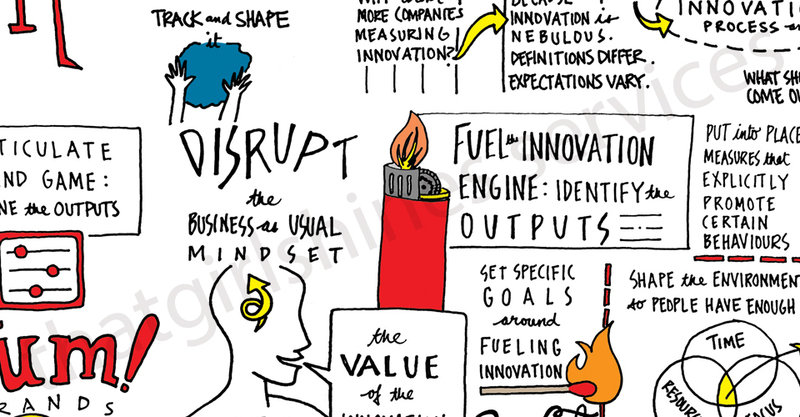 Innovation is a topic, as a graphic facilitator, I have been drawing and learning about for the last 17 years. While I read many articles and have drawn many experts’ opinion on Innovation – how to manage it, how to cultivate it, how to use it, how it can benefit organizations – I often find the missing piece is HOW to enact it in an organization with REAL, MEASURABLE results. Many times, an article will tell you WHY innovation is important but never HOW to tie it to financials; what does it look like with financial metrics? Soren Kaplan’s recent article in Fast Company’s Co-Design blog captured my imagination because he provides CONCRETE ways to measure it. Because of this, I could not resist drawing out his article. I hope you enjoy this not only for how pretty it looks but for the content provided in it. Thanks, Soren, for a wonderful article on innovation.